I just got my shoes shined professionally for the first time in years. Ok, I didn’t get them shined exactly as they’re suede. Instead I had them stoned and brushed, which is what I gather one does to suede shoes rather than shining them. All the pervious times I’ve had my shoes shined by a pro, the shiner was an old man. Not today, my friend. I went to the shoe shine place in the Crocker Galleria near the drycleaners where my show pants were living and in need of liberation, and I was pleasantly surprised to see the shiner was an attractive young woman, probably in her late 20’s with short red hair. I must say, it was an entirely different experience, not only because she was a woman, but because the process of stoning and brushing felt way more like a foot massage than a shoe shine. 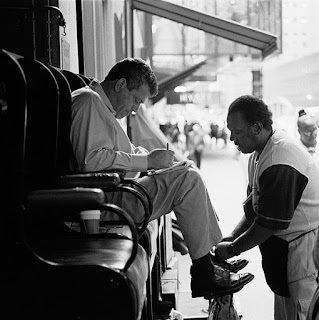 I also noticed that were she more buxom and wearing a low-cut shirt, from my vantage point up in the chair, I would have had a wonderful view of her cleavage, begging the question: why is there not a chain of Hooters-esque shoe shine stands littering every urban center of this country? I’m not asking that because I’m dying for there to be such a chain. My inner feminine side apologizes to all women for suggesting it, especially the one who shined my shoes this afternoon. It just seems like something someone would have tried already. If not some sleazy entrepreneur who doesn’t want to resort to pimping, at least some down-on-her-luck college student paying her way through school should have thought of this by now. This is America, after all. I’m just surprised. Maybe there’d be too much of a feminist backlash against having women in bikini tops attending to business men’s feet, but let’s face it, a lot of business men would pay extra for that, especially in the guise of a respectable shoe shine.